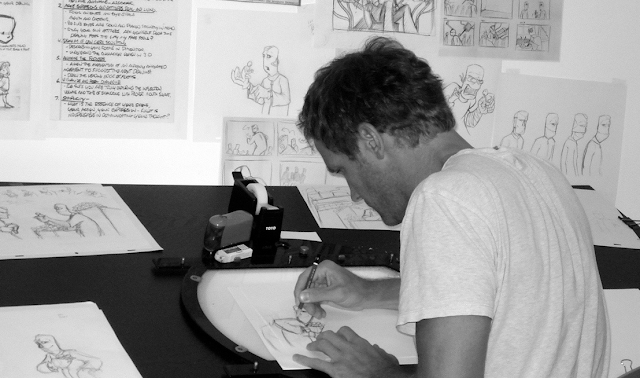 Patrick Smith is known for his metaphorical animated short films. Smith is a member of the Academy of Motion Picture Arts and Sciences, and a fellow of the New York Foundation of the Arts. His formative years were spent as a storyboard artist for Walt Disney, and animation director for MTV’s Daria and the Emmy-nominated Downtown. In the last decade, Smith has produced and directed over 10 independent award winning short films, screening at Tribeca Film Festival, Slamdance, SXSW, and Annecy. His PBS web-series "Blank on Blank" is the longest running and most viewed animated biographical series of all time, featured in Rolling Stone, New York Times, and Juxtopoz Magazine. His latest award winning animated short film "Pour 585" recently qualified for entry into the 2019 Oscars. Patrick lives and works in Montauk, New York, with his wife Kaori Ishida and their daughter. For inquiries or commissions, please contact the studio info@blendfilms.com.